Sometimes you just wish you could take everyone you know with you to see a garden. That's the way I felt last weekend when I went on the Coweta County Master Gardeners' tour. I wanted to stop everyone in Liz Tedder's garden and tell three stories: (1) How the 1830's house she rescued looked when I was growing up (2) How I'd gone there in 1988 as a columnist for the Atlanta Journal-Constitution, what the garden looked like then and what happened to me that involved blood and a hospital, and (3) what has been added since my last visit in 2008 (unbelievable). The description on the ticket brochure read: "Five acres of gardens surrounding an 1830's Federal style home. Beautiful gardens recognized in Southern Living magazine for the last two decades." I think I'll start at the beginning. For as long as I could remember, when I was in the car with my mother going from my small hometown to the bigger town of Newnan, I'd hear the same thing. "That's Tom Arnold's family homeplace." I'd look at the derelict house, the two stories teetering on stone pillars, windows broken out or long gone, rusting cars and farm implements sticking up through waist-high weeds, and, if the house was occupied, laundry hanging from a clothesline. The surrounding land was nothing but scrub pines. "Mr." Tom Arnold, as he was known to me, lived in our town in a very tidy, two story home which was old, but not nearly as old as the plantation house that had belonged to his family. Liz and George Tedder decided to take a chance on this ruin. I don't even know if Mr. Tom had ever lived there, but his ancestors had and were buried in an also-neglected family cemetery not far from the house. Liz was already a knowledgeable gardener when she moved here. She and George worked miracles to save the house. And then Liz started on the outside. The first major garden was the "chimney garden" on the south side. I remember 'George Tabor' azaleas up close to the house and then a long, rectangular lawn which stretched out to a gazebo at the end. Liz had two wide borders on either side. The day I went there to do the reporting was in August, and I remember Oriental lilies and large stands of blue platycodons. There was also a perennial garden around the swimming pool in back of the house. The AJC photographer and I stayed for a long time, marveling at what Liz had done. We could both see that there were already many flowers that spanned the seasons in the long border and around the house. I filled my notebook, and the photographer took lots of pictures. We left and drove to Newnan to get some barbeque at Sprayberry's. That's when I realized I'd left my pocketbook in back of Liz's house. We laugh about it now, but I guess I'm lucky it wasn't worse. After we ate, I drove back to Liz's house. Her car was gone. We parked in front, and I hopped out and ran around to the back. I didn't know Liz had a German shepherd. I had seen her other dog, but not this one. Before I knew it, I was face to face with a set of teeth set in vicious snarl. I turned instinctively and must have bent over because he hit me with great force in my right hip. I somehow beat him to the car and jumped on top. Then, I slid down into an open window, and the photographer took the wheel, and we escaped. I waited until we got back to Atlanta to go to the ER, where I stayed for several hours. I had a puncture wound and the most amazing and biggest bruise I'd ever seen. I had to get a tetanus shot. My daddy and I went back the following Sunday and retrieved my pocketbook. This is why I don't ever get much done. I've gone off on this tangent, when I really want to tell you about this amazing garden. There are so many areas, I can't even name them all. Liz has restored the cemetery and had the most beautiful heavy iron fence (she used some pieces of the original gate for an ironsmith to copy) installed around the family grave sites. Earlier in May, the cemetery was filled with the heirloom Gladiolus byzantinus which Liz found there once the cemetery was cleared. Last weekend, a sea of blue bachelor's buttons were just coming to an end. Liz has a new greenhouse, which is on an axis that runs through the giant potager (she has the Italian side and the French side). But this is just one new addition to an assortment of different gardens: Several "barn" gardens, a white sunken garden, the playhouse garden (oh to come back as a child and have this little furnished house and its garden), borders which lead to other areas packed with flowers and shrubs, new flower beds that surround the cemetery, a boxwood garden under giant shade trees in front, huge plantings of shrubs and ornamental trees along the railroad tracks (two CSX trains came by while I was there last Saturday), and shrub and tree borders that edge the woods. Liz laughs that she finally got George to clear all the fence lines around the rolling pastures, and now she's starting to plant them, as well. I have to stop here, because I've forgotten to mention so many of the other garden areas like the grape arbor and herb garden. Liz loves symmetry and geometric patterns, and so she has organized much of the garden around long allees, boxwood parterres, stone borders, picket fences, paths that lead around outbuildings, and of course, the original rectangular lawn. 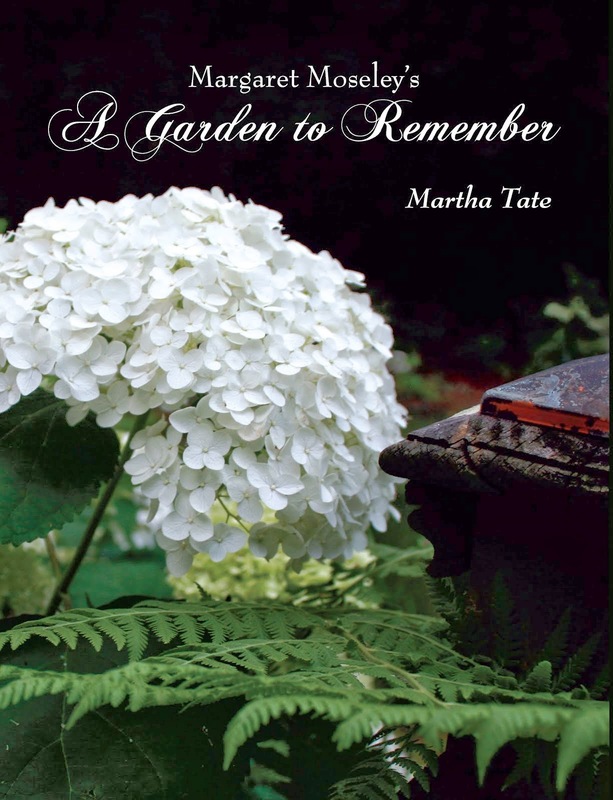 It's no wonder she has scrapbooks filled with articles from national magazines, many of which featured her garden on the cover multiple times. To defray some of the costs of the upkeep and of the very expensive cemetery fence, Liz offers a $25 season ticket so visitors can come and see how the garden changes every two weeks. This way, someone is there to answer questions (I think it's open on certain weekends and every other Wednesday during the growing season). This season pass will also ensure that you don't have a close encounter of the scary kind like I had, even though Major is resting peacefully in the garden now.